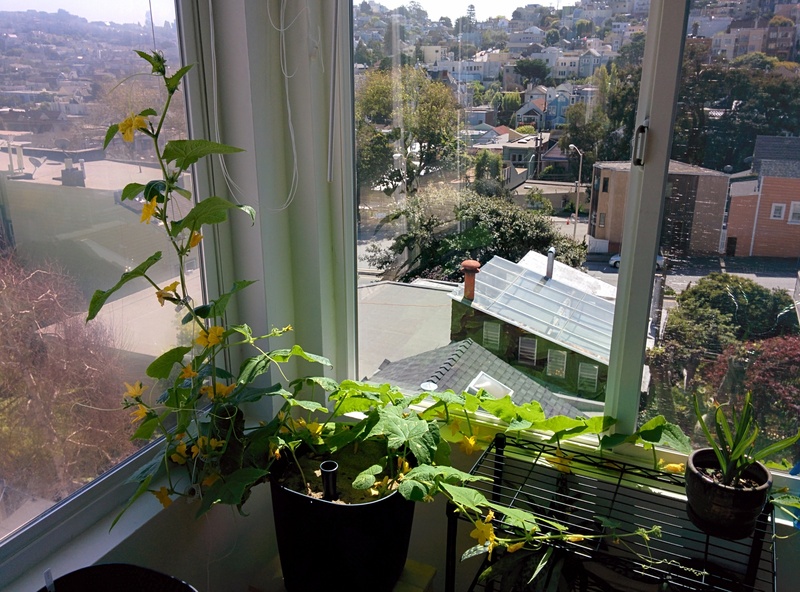 My first trial with growing cucumbers in San Francisco was with Straight Eight. It grew to several inches tall and withered to nothing. The next year I tried the same variety with the self watering RGGS and it grew, very slowly. Over 6 months a total of 7 cucumbers were picked totaling 1.4 kilos. Not very impressive. Then after looking for a cold tolerant variety (no luck) I decided growing them outdoors was impractical here and decided to find a bush, compact variety to grow indoors in a container. I settled on Bush Spacemaster and two of them have been growing for 85 days now, with 4 cucumbers weighing a total of 1.3 kilo. Instead of branching out each has produced a single vine about 1.5 meters long and flowers – lots of flowers. Flowers that had to be hand pollinated in a window of about a day. There were so many flowers in fact that it prompted a purchase of a Dustbuster. 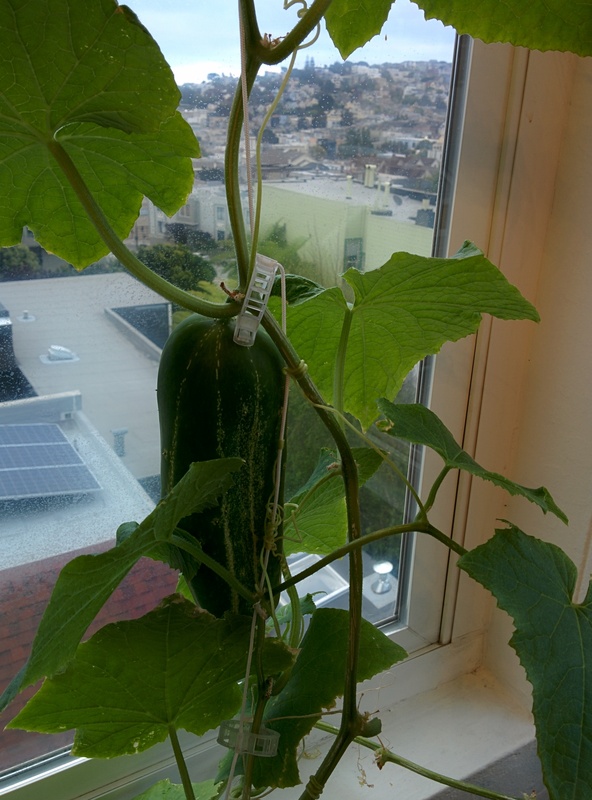 I quickly realized standard cucumber varieties would be a lot of work indoors and decided to look into parthenocarpic varieties which are self-pollinating. A lot more pollinated cucumbers are waiting to grow. Some quick research yielded this list of varieties which I further broke down into cost per seed from various seed websites. The surprising thing is that some of these seeds are over $1 each. True, parthenocarpic varieties by nature should be a little more expensive since they are hybrids, but $1.72 for a seed? Wow. Rocky (baby) 6.65 10 $0.67 46 days. The perfect one bite, seedless cucumber that is ideal for snacks, salads, and lunch boxes. Baby cucumbers are quite chic in the vegetable world and for good reason. They are crisp, delicious and a fat-free source of potassium and vitamin C. Rocky matures early and produces an abundance of fruit at both low and high temperatures. Rich green, smooth fruits are best harvested when 2-3 inches long. No pruning necessary. PAT, PM. Socrates 6.95 10 $0.70 Dark green, thin-skinned, 7-8″ fruits are tender, sweet, and seedless. Suitable for growing indoors with temperatures ranging from 50-82ºF/10-28ºC. Parthenocarpic. Intermediate resistance to powdery mildew. Tyria 11.95 10 $1.20 Avg. 14″, lightly ribbed, beautiful, dark green fruits. Delicious and bitter-free. Trellis for straight fruits. Gynoecious and parthenocarpic. Intermediate resistance to powdery mildew. Diva 1.95 30 $0.07 Diva produces distinctly tender, crisp, sweet, bitter-free, and seedless cukes. Foliage is nonbitter, hence not as attractive to cucumber beetles as some varieties. Adapted to open field production and protected cropping. Harvest at 5-7″. Gynoecious and parthenocarpic. Intermediate resistance to cucumber vein yellowing virus, downy mildew, and powdery mildew. Tasty Jade 3.65 30 $0.12 Vigorous, high-yielding plants produce glossy, thin-skinned, 11-12″ long fruit with crisp, fresh flavor. Parthenocarpic. Suitable for outdoor or greenhouse culture. Trellis for straight fruit. Intermediate resistance to downy mildew and powdery mildew. Dishon 11.15 25 $0.45 Short dark green 6 in/15 cm fruit on early maturing plants with high yields. Fruit have smooth skin and unique flavor, popular type in the Middle East. Packet contains 25 seeds. Camaro 43.05 25 $1.72 Best endurance for hot summers. Moderate plant habit saves labor. Very high yields of excellent quality 16 in/40 cm fruit during spring and autumn months. Intermediate PM tolerance. h-19 little leaf (pickler) 3.95 30 $0.13 Blocky, medium-length (3-5″) fruits are good for fresh eating. They pickle well, and have a distinctive, bright emerald green color. Vines are compact, multibranching and yield well even under stress. Half normal-sized leaves provide easy visibility and harvesting. Parthenocarpic. White spines. Intermediate resistance to cucumber mosaic virus, downy mildew, and powdery mildew. I chose two varieties from this list, H-19 Little Leaf and Diva. We’ll see how these do indoors.